I love stuffed mushrooms. Always have, in any form. Clearly I’m not alone on that as my bacon wrapped crab stuffed mushroom recipe is easily one of the most popular ones on my blog. These ones don’t have bacon, or crab, but they’re still pretty fantastic. It’s tacos in stuffed mushroom form, what could be bad about that? Okay, if you’re my family you’re saying that the black beans are the bad part and I never should have done it. But I’m sorry, I disagree. Tacos in any form are better with black beans. And that includes taco stuffed mushrooms. I really enjoyed these. They’re the perfect appetizer, and they freeze extremely well. You can make them ahead and then reheat them later. Or freeze them and reheat them, in the oven or microwave to enjoy at a later date. They are better reheated in the oven, but if you’re short on time or are just sneaking one from the freezer for a snack (um, I wouldn’t know anything about that…) they are still pretty tasty microwaved for a couple of minutes. Also, I’d highly recommend serving them with some salsa. Because what’s a taco without some salsa on the side? Not as good, that’s what. If you’re in need of an appetizer, you should definitely try these out. 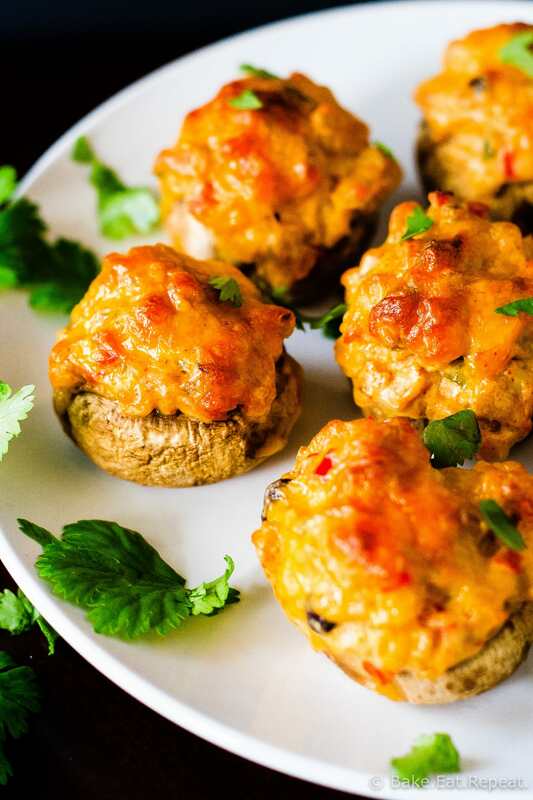 Or if taco stuffed mushrooms aren’t your thing, try the crab stuffed ones. There’s a reason those are so popular! Note: These would have been great with a little more heat as well, so if you like things spicy feel free to leave in some of the jalapeno seeds. I seeded it with the crazy hope that the kids would try them! Wash the mushrooms and pop out the stems. Chop the stems finely. In a large non-stick frying pan over medium heat, saute the onions until softened. Add the garlic, the chopped mushroom stems, red pepper, jalapeno pepper, chili powder, cumin, coriander and salt and pepper. Continue to saute for 3-4 minutes until the onions have browned and the mushrooms have released their liquid. In a large bowl, mix together the cream cheese and the egg yolk until well combined. Stir in 1/2 cup of the shredded cheddar cheese. Add the onion mixture, the black beans and the corn and stir well. If the mixture is really soft, place the bowl in the fridge for 5-10 minutes to allow it to firm up before filling the mushrooms. Bake for 20-25 minutes or until the cheese is bubbling and the filling is hot. Let them cool slightly before eating. The mushrooms can be prepared a day in advance and kept in the refrigerator until baking. Or you can prepare them and then freeze them before thawing and baking. Or bake and then freeze to reheat them later. If you freeze them, do you have to thaw them before reheating or do you just pop them in the oven? And do you recommend baking before freezing, or rather not? I've never made stuffed mushrooms so I have no clue how to go about it :-) Thank you! Which you do totally depends on your time and what you prefer. I've tried both methods and both work just fine. If you bake them before freezing, you don't need to thaw them, just reheat them from frozen - in the oven at 350F for 20-25 minutes. If you freeze them before baking, let them thaw before putting them in the oven. I haven't tried baking them straight from frozen when they weren't pre-cooked so can't say what the timing would be and how well that would work. Thank you for your reply! I had no idea how long I had to reheat them. Making these today, to serve at my birthday next week! What an awesome idea! I love tacos (and black beans ;) ) and I love stuffed mushrooms! Such an awesome combo! I love stuffed mushrooms and the taco filling for these looks incredible! These are the perfect little bites, Stacey ... and SO creative! Love stuffed mushrooms of any kind! I love mushrooms and taco anything, so I can't wait to try these! Thanks Kelly! I was pretty happy to finally change it up - my old design kind of annoyed me! :) I loved these mushrooms, taco flavours in a stuffed mushroom worked surprisingly well! 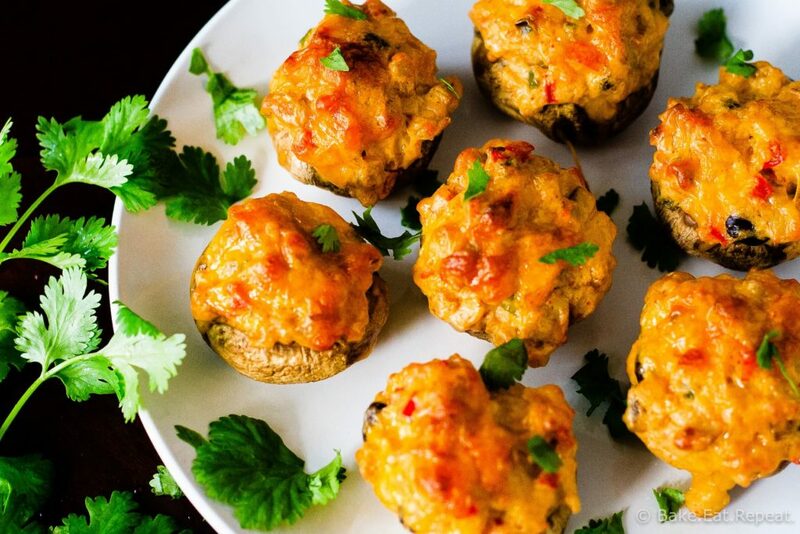 Wow these pretty much have to be the best stuffed mushrooms ever! I love the taco filling, Stacey! This is so creative! I can't wait to try this out. Pinned! Thanks Gayle! Can't go wrong with taco flavours right? We loved these! Thanks for pinning! So creamy and cheesy, this is such a good appetizer idea. Umm. . .you're a genius. I have to make these for my husband. Mushrooms and tacos are two of his favorite foods. I know he's going to love these. . .and he's going to want his spicy! Yeah I think I would have liked them spicier, but I was hopeful that the kids would try them. I don't really know why I dream! :) Hope you like them, thanks Sara! These are so fun! I love taco everything. I can't believe I've never seen your remodel -- it looks awesome! Thanks Ashley! It's pretty new, just did it last weekend, and I love it. So much nicer than the last one! I love black beans in anything - gonna try these for Taco Tuesday! I do too, especially in taco anything! Thanks Jenny! What an awesome savory appetizer! These look delicious- pinning! Thanks Medha - and thanks for pinning! This is such a genius idea! Pinning for our next get-together! Thanks Anna, hope you enjoy them! 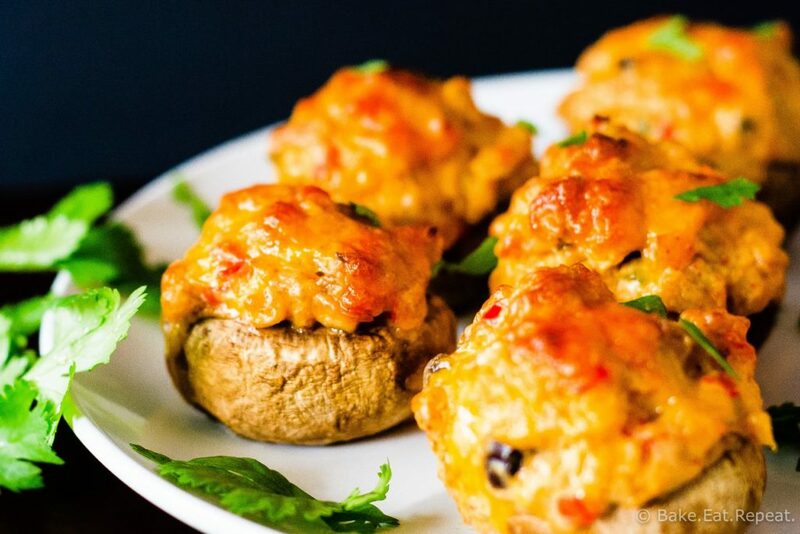 I think these are the best looking stuffed mushrooms that I've ever seen, what an amazing appetizer! Thanks so much Sara! They were pretty tasty! I'm usually not a fan of mushrooms, but I think I'd enjoy these. The cheese taco stuffing has won me over! It's hard not to be won over by cheesy taco goodness! :) Thanks Jen!